Apple's iWatch has reached the "engineering verification test" (EVT) stage of development and will likely beginning shipping in 2015, according to a new report from Digitimes. While components for the device are said to be in production, sources close to the matter stated the device must also head to production verification testing (PVT) before entering mass production. Digitimes also claims Apple is "unlikely" to unveil the iWatch during its upcoming September 9 media event, which contrasts with reports from the likes of Re/code and Bloomberg last week stating that the device would be introduced alongside the iPhone 6. A previous report suggested Apple would be debuting the device at an October event, but Re/code noted the company later ended up changing its plans. 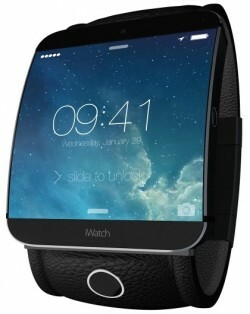 However, an early 2015 launch for the iWatch has been suggested by a number of sources, as part leaks for the device have also been non-existent to this point. Recent rumors have suggested the device will include an array of sensors to track health and fitness-related metrics, and will be positioned as an iPhone accessory that tightly integrates with iOS 8. For the love of all that is holy, I pray it doesn't look like that mockup. Can we all take a second and hope that it doesn't look like this mockup? Ok I think I'll trust re/code over DigiTimes. Why would Apple hold an event at the flint center if they have not something to announce besides the iPhone 6? Isn't it awful?! That's what I'd come up with if I tried to design a watch. Just because it's not shipping until 2015 doesn't mean we won't see it on stage.